Help children create more realistic illustrations of the world and its people with this set of eight multicultural markers in a variety of skin tones. The quick-drying, low-mess ink reduces smearing and bleedthrough, while the conical tips produce both thin and thick lines. What’s more, the ink rinses or wipes off children’s skin with no soap or scrubbing. 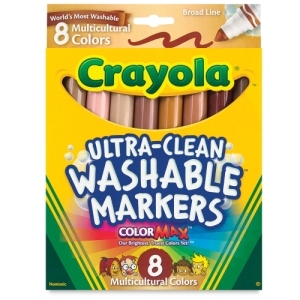 The set contains eight markers, including one each of Golden Beige, Tawny, Terra Cotta, Beige, Tan, Sienna, Bronze, and Mahogany. Classpack of 80 — This classpack contains 10 each of eight colors, including Golden Beige, Tawny, Terra Cotta, Beige, Tan, Sienna, Bronze, and Mahogany.